Moringa-O2 is known for their skincare products -- let's start with my favorite, the Malunggay herbal Soap , the Herbal lotion which smells divine! And they also came up with Facial Toner. The brand obviously is a huge success that's why they FINALLY came up with hair care products! Finally because I've been waiting for them to release this line for the longest time! I first got this set from my Sample Room Family a few weeks back and actually gave the shampoo and conditioner a try IMMEDIATELY that night! I am actually amazed on how nice both products are, that's why when I got a personal event to attend their intimate launch at Salon De Ning, Manila Peninsula with their endorsers --- Team Kramer, I had to at least pass by the show my support! Because their products are amazing! Both shampoo and conditioner contains argan oil so hair feels smooth and frizz-free after first few uses. Hair looks healthy after a week's usage. Never weigh my hair down even on hot summer! My color-treated hair looks more vibrant. You may need more product especially the shampoo for it to lather. Has a light scent but goes away after application. Hair definitely looks shinier and livelier. May not be enough for hair that is EXTREMELY frizzy. 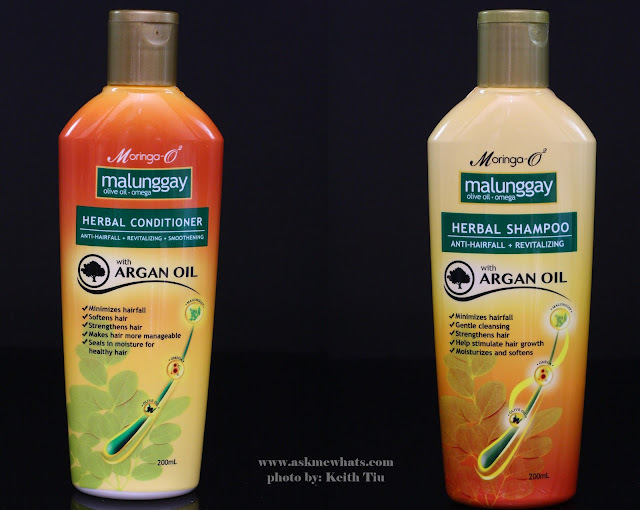 Overall, I am very happy with this hair care line from Moringa-O2! I am actually halfway done with my shampoo and conditioner combo and still have 3/4 left on my serum! Have you tried Moringa-O2 hair care products? why? may past bad experience?